If you are looking to set up a business, then a sole trader structure may be the best option for you. Here are all the advantages and disadvantages of operating as a sole trader to help you decide if this is the best business structure for you. A sole trader is a business structure that is incredibly popular in the UK for small businesses. An individual trading as a sole trader is also referred to as self-employed. A sole trader business structure, with its ease of set up and full control, makes it an appealing business structure. It is a particularly popular structure amongst freelancers. 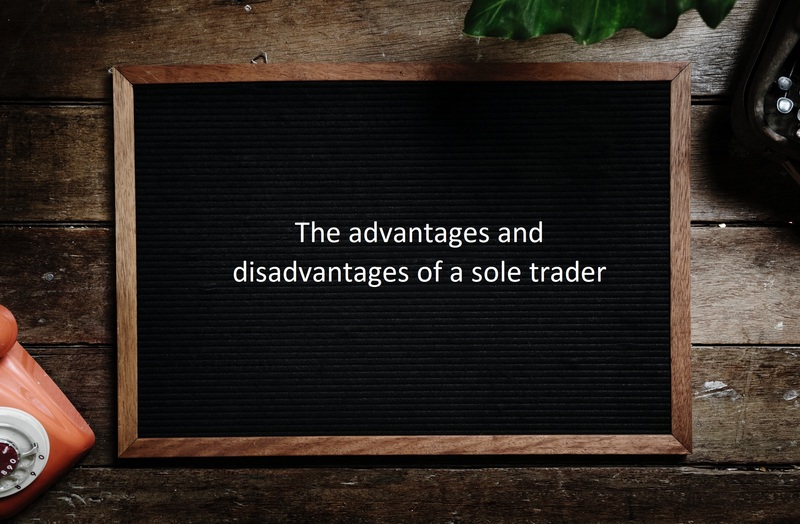 A sole trader has many advantages, making it a popular business structure for small business owners. Here are all the advantages that come from setting up a business as a sole trader. The main benefit of being a sole trader is that you are your own boss and you can dictate the direction of the business. As a self-employed sole trader, you will be able to run your business as you wish. This is perhaps one of the biggest reasons why people leave employment to start their own business. A sole trader has more freedom with decision making compared to a partnership structure, for example. A partnership business structure will most likely involve making joint decisions and sharing the ownership and the direction of the business. Another benefit of being a sole trader is that you get to keep all the profits after tax on your business. If you were to form a partnership then you would have to share these. Also, if you were to form a limited company, you may need to share the profits of your business with any investors/shareholders. The process of setting up as a sole trader is much easier and more straightforward than setting up a limited company. Becoming a sole trader is easy because all you have to do is inform HMRC and register as self-employed if you have earned more than £1,000 from 6th April to the 5th April of the following year. Keep in mind, this value may change over time. Registering with HMRC is simple, as you can do so by filling in a form online. Registering with HMRC is free, so setting up as a sole trader does not incur any costs. Alternatively, if you were to set up a limited company you would be required to pay to form a company with Companies House. Therefore if you are starting a business, depending on what it is, you may have lower start-up costs going for the sole trader option. A limited company has to register with Companies House and provide information which is then on public record. A limited company owner will have to provide business details, and details on the directors and shareholders. This reduces the privacy of the business. As a sole trader, you don’t have to register your business with Companies House, allowing you to keep your business private. If you want to start small and later expand, operating as a sole trader allows you to do that. You can easily change your business structure. For example, if your business starts to see an increase in its income, you may find it more tax efficient to start running your business as a limited company. You can do this easily. It’s not a complicated process, allowing you to keep an open mind about future opportunities. There are of course also some disadvantages of setting a business up as a sole trader and here they are. If you opt for the sole trader business structure, you and your business will be seen as one entity. This means that you have unlimited liability for your business. A limited company and its owner, however, are seen as two different entities. As essentially a sole trader and their business are the same, any business actions and debts are the responsibility of the owner. There is no protection of personal finances and assets, therefore being a sole trader can be more financially risky. Limited companies are generally considered more tax efficient than sole traders. A limited company director can work around the taxes and maximise their income. Whereas, a sole trader has less flexibility to work around the tax system. A sole trader will have a tax free personal allowance of £11,850 (2018/19) and then they will have to pay tax on any further incomes as follows: for example, if they earn between £0 and £34,500 they will have to pay the basic rate of 20%. The higher rate is 40% on income from £34,510 to £150,000 and the additional rate is 45% on income over £150,000. More on tax rates here. When you are a sole trader, it is very likely that you will be working by yourself. This can make it really difficult to take time out and away from the business, although it’s essential to do so. It can be difficult to take breaks, however, it’s not impossible. You need to plan, be organised and schedule time in for a break. Although making decisions is seen as a positive as you have all the control on the business direction and goals, it can be a daunting prospect, making you feel pressured. When the whole business is reliant on a single individual’s actions and decisions, it can be stressful, which can actually sometimes result in poor decisions. Limited companies have a certain prestige that sole traders do not have. This prestige and can help with attracting investors and clients as well as helping to create a professional image of the business. As a sole trader, it will be difficult to create that big business image that limited companies have. As sole traders are seen to be riskier than other business structures, they are less likely to secure funding from traditional sources such as banks. Raising funding for your sole trader can be difficult. Therefore, any entrepreneurs will need to weigh up the options and see if they can either find another method of funding or change the business structure. Although, it’s worth pointing out that sole traders usually have low start-up costs requiring minimum funding. More on sole trader accounts and bookkeeping and the advantages and disadvantages of limited companies.